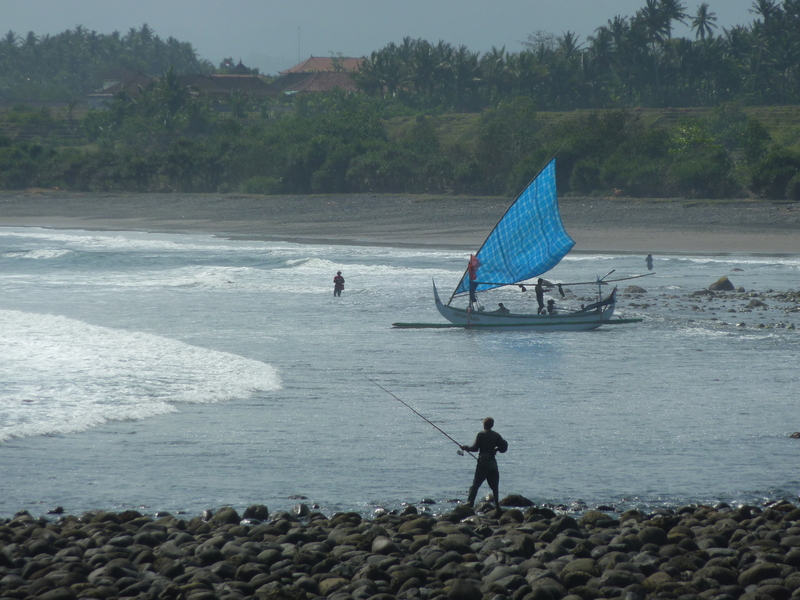 After bidding a fond farewell to Lembongan, I returned to Bali and journeyed across the middle of the country and up along the southern coast into West Bali which is supposedly the least populated part of the country. Nevertheless the traffic along the main coastal road is still a bit chaotic as you’re sharing it with long haul truckers headed to and from neighboring Java. Be prepared for some very aggressive passing and running three wide isn’t uncommon. 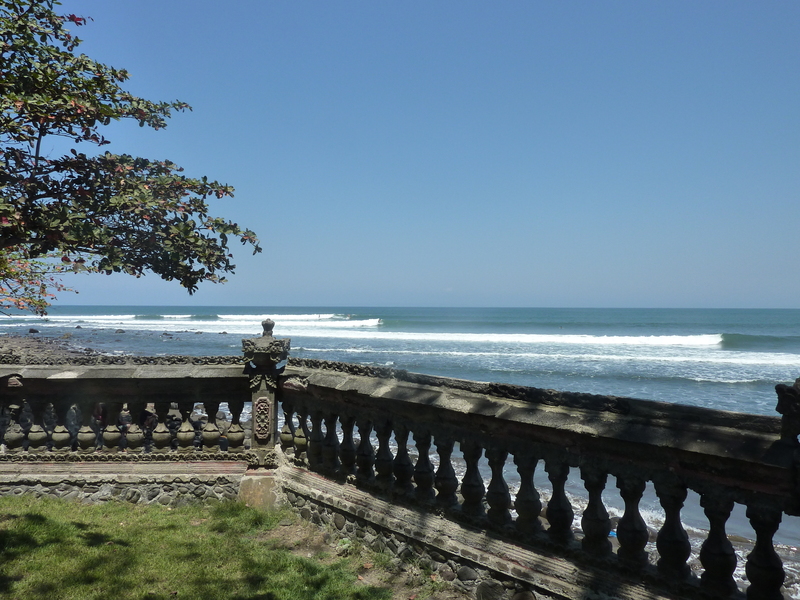 After about a two hour drive we reached the turn off for Medewi… my destination and home to what is reportedly the longest lefthand pointbreak in Bali. There isn’t much to Medewi… a couple of simple homestays and a warung or two offering nasi goreng (fried rice) and Bintangs. Most of them are situated along the quarter mile turn off road that dead ends at the wave. 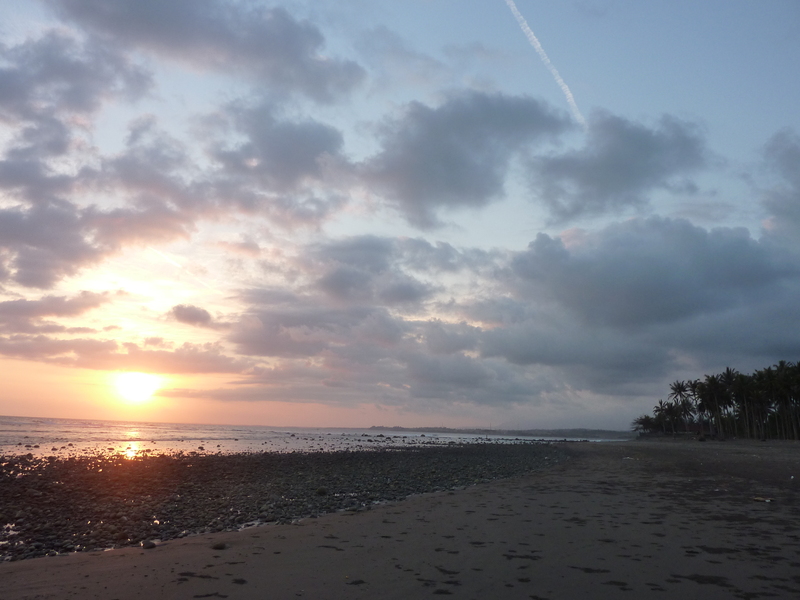 At the end of that road right on the beach overlooking the point are the Medewi Beach Cottages. I would hang my kookish sun protective surf hat there for the next few evenings. As advertised, Medewi is indeed a long lefthander. It breaks over cobblestones and boulders and thus would seem to have more in common with some of the set-ups in Southern California than your typical Balinese reefbreak. No coral in sight. The water is murky unlike the crystal clear and turquoise waters of Lembongan and the Bukit Peninsula. The largest waves that rolled through during my stay were a foot or two overhead. It’s an easy takeoff after which you pick up a bit of speed before hitting a section that backs off a bit. If you play your cards right and make it through that sluggish section, then it’s off to the races on the inside which gets a little steeper and a little more critical and a lot more fun as it speeds along until you kick out. It’s a fun wave suitable for all levels (at least when its smallish) and all boards and it certainly lends itself well to a little logjammin’. The locals surf it very well. The students in the German surf camp that showed up periodically while I was there? Not so much. As previously noted, there’s not much around other than the wave and thus my non-surf hours were mostly spent reading by the pool, taking a few long strolls on the beach, getting one of the best massages of my life and drinking Bintangs with a couple of Australians who were also there for the surf. Among them were Baz and John both of whom had taken 2.5 years back in the 70’s to travel slowly overland from Western Europe to India via the Silk Road. No phones. No Internet. No email. No Lonely Planet. A different time and experience indeed. George is a 59 year old from Perth who moved to Australia with his parents when he was but a lad. From where? Malta! George had some great tales about making the long voyage between Australia and Malta including a crossing on his own when he was 15 for which his parents allotted him about $100 travel money for the month long trip. George wisely invested almost all of it in cold foamers and smokes within the first week of the trip. He’s one of the most stoked older surfers I’ve ever seen in the water. First in. Last out. He’s an inspiration. A word about the massage I mentioned above… it was indeed fantastic and it was an interesting mix of Balinese and Thai technique. But that’s not why I mention it. I mean who wants to read about how good someone else’s massage was? What I found interesting (and thus why I mention it) was the fact that she is part of Bali’s small Muslim minority (the vast majority of Balinese being Hindu) and thus she wore the traditional head scarf as well as long sleeves and pants which certainly aren’t the most climate appropriate choices. This part of the island has quite a few Muslims (perhaps due to its proximity to Java?) which is reflected in many of the names here being Arabic rather than Balinese. Midway through my massage, I heard the afternoon call to prayer from the mosque somewhere down the beach followed by the actual prayers being sung or chanted over a distant loudspeaker. They were actually quite beautiful when mixed with the sound of the ocean and I made it a point while I was in Medewi to sit along the beach and listen whenever that loudspeaker crackled to life. But back to the massage… I couldn’t help but thinking that a certain type of Muslim (or perhaps even Allah himself) might be somewhat displeased to see a female follower skipping afternoon prayers in order to massage a western man (and an infidel!) clad only in his surf trunks. My hope is that my enjoyment of the actual prayers served to balance my spiritual account with Allah in this regard. Judging by my continued luck with great waves thus far on the trip, I’d say we seem to be squared away. 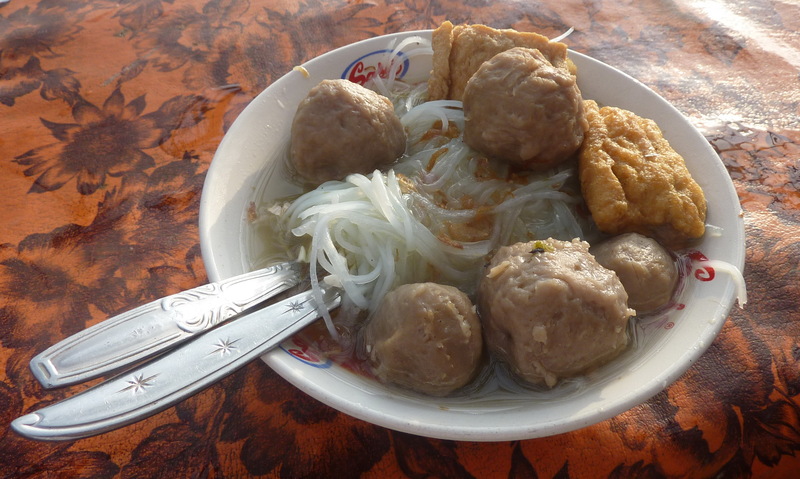 Final note on Medewi… Bakso Arohman! 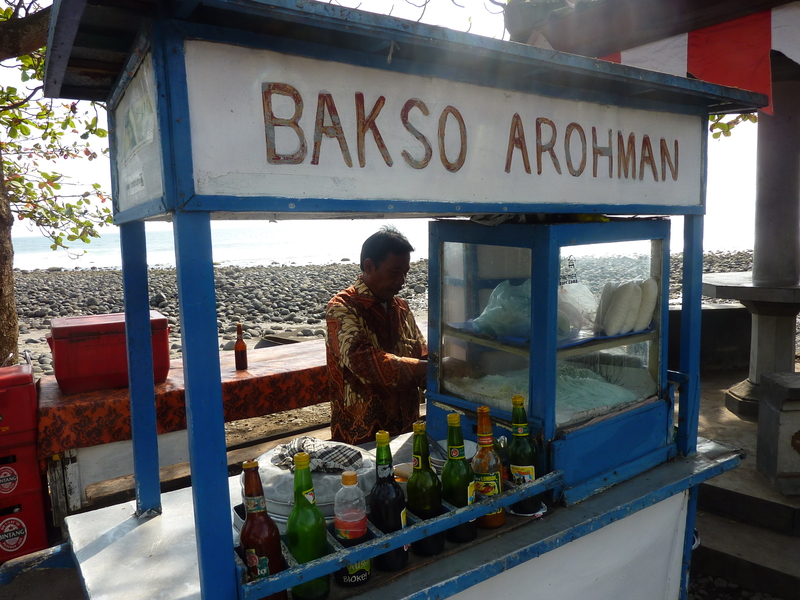 Parked squarely at the top of the steps coming up from the sand near the break is Arohman with his bakso cart. Bakso (at least a la Arohman) is comprised of meatballs, beef broth, rice noodles, yellow noodles, tempeh, shallots and something green and herb-like, all of which is seasoned liberally with sambal (Indonesian hot sauce) and soy sauce. Arohman was dishing it up for roughly a dollar a bowl and expertly pairing it with an ice cold Bintang of the 2012 vintage. 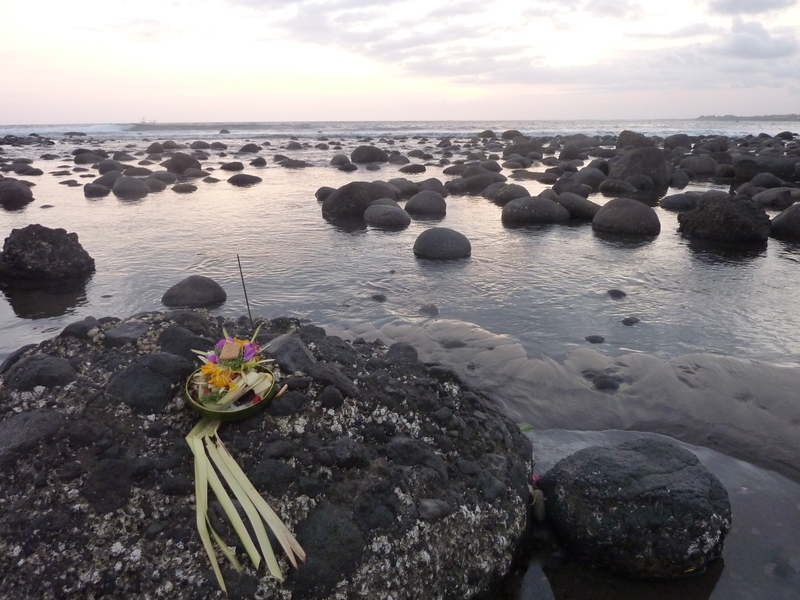 Arohman would have a hot bowl and a cold bottle in your hands within minutes of the end of your surf. And my do they both go down well when you’re fresh from the ocean. Can we please get a bakso cart back in LA at County Line?